James Abram Garfield was an American political and military leader who rose to the rank of major general in the Union army during the American Civil War, and who served as a U.S. Congressman and Senator before being elected as the 20th President of the United States in 1880. James Abram Garfield was born on November 19, 1831, in a log cabin in Orange Township, Ohio, near Cleveland. He was the youngest of five children of Abram Garfield and Eliza Ballou Garfield. Garfield's father died at the age of thirty-three, when Garfield was just seventeen-months old. After his father's death, Garfield's mother raised the family by managing the family farm. Garfield attended local schools, and as teenager, he briefly worked as a helmsman on the Ohio and Erie Canal. Garfield attended the Geauga Academy in Chester, Ohio in 1849. From 1851 through 1854, he attended the Western Reserve Eclectic Institute (later Hiram College) in Hiram, Ohio. Garfield completed his formal education at Williams College in Massachusetts from 1854 to 1856, where he graduated with honors. After graduating from Williams, Garfield returned to Ohio, where he was employed as a professor of ancient languages at the Western Reserve Eclectic Institute from 1856 to 1857. He then served as the principal of the school from 1857 to 1860. During Garfield's tenure as principal, he married Lucretia Rudolph on November 11, 1858. The couple had met when they each attended the Geauga Academy nine years earlier. One year prior to his marriage, Garfield began studying law, and in 1860, he was admitted to the Ohio bar. Garfield began his political career in 1859, when he was elected as a Republican to the Ohio Senate, where he served until 1861. When the American Civil War began Garfield lobbied Ohio Governor William Dennison for a commission in the Union Army. In the summer of 1861, he entered the military with the rank of colonel in command of the 42nd Regiment Ohio Volunteer Infantry. In the autumn of 1861, Major General Don Carlos Buell placed Garfield in charge of the 18th Brigade of the Army of the Ohio and ordered him to clear Confederate forces from eastern Kentucky. In December, Garfield's brigade departed from Catlettsburg, Kentucky and engaged Confederate troops, commanded by Brigadier General Humphrey Marshall, in early January 1862. On January 10, 1862, Garfield's soldiers defeated the Rebels at the Battle of Middle Creek. Garfield's victory at Middle Creek helped cement the Union's hold on eastern Kentucky and enabled the Federals to carry the war into eastern Tennessee. For his efforts, Garfield was rewarded with a promotion to brigadier general, effective January 11, 1862. After the victory at Middle Creek, Garfield was ordered west, where he commanded the 20th Brigade of the Army of the Ohio at the Battle of Shiloh (April 6 and 7, 1862) in Tennessee. Immediately after this battle, Garfield served under Major General Thomas Wood during Henry Halleck's Siege of Corinth, Mississippi (April 29 to May 30, 1862). During the summer of 1862 Garfield suffered an illness, forcing him to return home on leave to recuperate. Garfield returned to active duty in the fall and was sent to Washington while awaiting orders. In November, although he did not actively seek the office, voters in Ohio's 19th Congressional District elected Garfield to the United States House of Representatives. 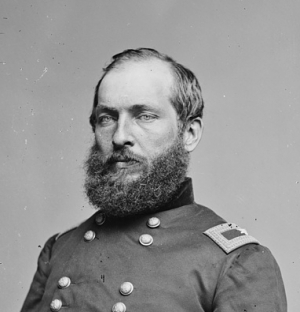 In the spring of 1863, Garfield returned to combat duty as Major General William S. Rosecrans's chief-of-staff. While with Rosecrans, Garfield served with distinction and was promoted to major general for his gallantry at the Battle of Chickamauga, Georgia (September 19 and 20, 1863). When Major General Ulysses S. Grant relieved Rosecrans of his command after the defeat at Chickamauga, he chose George Thomas instead of Garfield to command the Army of the Cumberland. Garfield subsequently resigned his commission and assumed his seat in Congress in December 1863. Upon joining the United States House of Representatives in 1863, Garfield became aligned with Secretary of the Treasury Salmon P. Chase and other Radical Republicans. As such, he favored harsh terms for the South when the war ended. In 1864, he voted in favor of the Wade-Davis Bill, which President Lincoln pocket-vetoed. Because of Lincoln's lenient Reconstruction policy Garfield did not actively support the President's reelection. Garfield served in the House of Representatives for nine terms from December 1863 until March 3, 1881. On January 13, 1880, the Ohio Senate elected Garfield to the United States Senate, but he never served because he was elected to the presidency later that same year. When the Republican National Convention met in Chicago in June 1880, support for a presidential candidate was divided between three men: Maine Senator James G. Blaine, Ohio Senator John Sherman, and former President Ulysses S. Grant. When none of the candidates could garner enough votes to secure the nomination, Garfield emerged as a compromise candidate. On June 8, 1880, after thirty-six ballots, the delegates selected Garfield as their nominee for the 1880 presidential election. Throughout the summer and fall, Garfield conducted the first "front porch campaign" from his home in Mentor, Ohio. On November 2, he won a close contest against fellow Union Civil War General Winfield Scott Hancock. James Garfield was inaugurated as President of the United States on March 4, 1881, but he served only six months. At 9:30 a.m., on July 2, 1881, Charles Guiteau, a deranged office seeker, shot the President at the Sixth Street Station of the Baltimore and Potomac Railroad in Washington, DC. Garfield survived the shooting and lingered in poor health for ten weeks before dying from complications on September 19, in the Elberon section of Long Branch, New Jersey. Garfield's body lay in state in Elberon and Washington before being returned to Cleveland for his funeral on September 27. He was buried in Lake View Cemetery. In 1890, President Garfield's remains were moved to the newly-erected Garfield Memorial in Lake View Cemetery in Cleveland. James Abram Garfield was an American military and political leader during the 19th century. Rising from humble beginnings, Garfield rose to the rank of major general for the Union army during the American Civil War. In 1880 he won a close election against fellow Union general Winfield Hancock to become the 20th President of the United States. Garfield served only six months in office before dying from an assassin's bullet on September 19, 1881.